Americans are, at heart, giving persons. 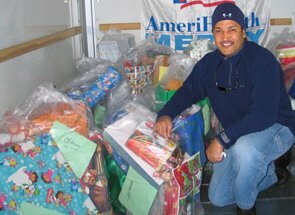 Always strike us how that is so when the Season starts to warm up and we start to answer emails of people asking about the Angel Tree program. Singular. They want to give. But invariably we have to answer them about the Angel Tree programs. Multiple. Because that’s who we are; we don’t have one such program, we have at least two. The two best known are from Christian organisations: the Angel Tree prison fellowship and the Salvation Army’s Angel Tree program. Angel Tree works year-round for the 1.5 million children who have a father or mother who’s in prison. At Christmas time volunteers from participating churches buy gifts and deliver them to the kids but in the name of the parents. The Salvation Army’s Christmas Angel Tree program, recently renamed to Holiday Christmas Angel Tree program, get children from families in need new clothes or toys. Usually a corporation sponsors a tree placement. The tree is decorated with paper angels, each of which has the first name of a child as well as the age and gender of the child. A person can take the paper angel of the tree and get a gift that’s just right for such a kid. The Angel Tree program is centered more around churches while the Salvation Army’s program relies on sponsors such as corporations or neighborhood associations for the placement of its trees. Every year I’m so impressed with the number of people emailing us, asking “can I give to your angel tree program”, “how to give to the angel tree” or “how can I start an angel tree”. We both feel a bit honored that people think we’re involved!